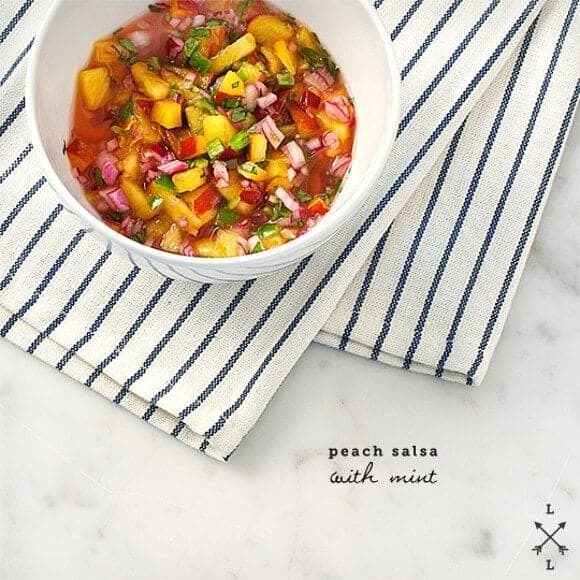 Make this sweet, tangy, and spicy peach & mint salsa as an appetizer for your summer party! 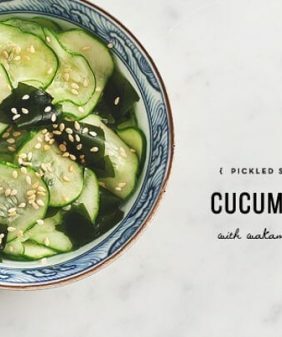 Also delicious on tacos, grilled fish, or in a summer salad. I’ve been binge eating peaches lately. Usually I’m pretty disciplined about buying only a few peaches at a time. I’ll even stagger my peach buying… 2 one day, 2 a few days later, so that every few days (during peach season) I have a manageable amount of peaches to consume on that one day when they’re perfectly ripe. So when my bi-weekly Farmhouse Delivery started sending me 12 peaches at a time (for the last 3 bushels in a row) my summer “peach system” was, needless to say, wrecked. (I know, it’s rough… my life… they’re really awesome peaches too). That is until last week they sent me about 10 jalapeños. So this time instead of eating all 12 peaches in (practically) one sitting, I chopped up the extras with some of my jalapeño bounty and made this peach salsa. My intention was for this salsa treatment to extend the peaches – they should last a few days longer in the fridge preserved in lime juice. But Jack and I polished this off in one sitting on some tacos. So I guess the peach binge continues. 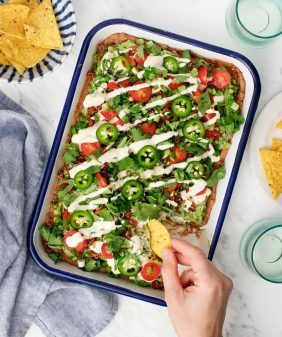 This would be great on so many summery dishes – on top of grilled fish, on a salad topped with black beans or shrimp, in tacos, or just scooped up with chips. Juice the lime into a small bowl and add the chopped red onion. 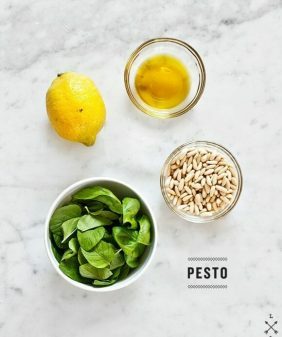 Set aside - the onion's flavor will mellow as you prep the other ingredients. When you have finished chopping the peaches, jalapeño, and mint, add them to the bowl with the lime juice and onion. Add the lime zest and a pinch of salt and stir. Taste and adjust seasonings. This is best if chilled in the refrigerator for a least 20 minutes in order for the flavors to mesh together. No peaches yet here in Washington. I only like peaches when they’re local & in season. Otherwise, they’re a huge let down. But when they are freshly picked, oh my. That is heaven. Costco carries a tolerable storebought fresh salsa. It’s actually quite good, but pales in comparison to the likes of the real, home made stuff. These pics are making me CRAVE some good peach salsa right about now. oh so sad… I keep forgetting that we get this kind of produce earlier than northern states. The texas peaches this year are amazing! Going to be moving to San Antonio this fall, so I’ll get to enjoy some of that nearly year-round fresh produce. I really love the combination of sweet juicy fruit and zingy jalapeño. This sounds utterly delicious. Haha, I thought I was the smart one to come up with using lime zest in salsa :). I do have an overabundance of peaches here in Texas right now, so salsa seems like a great idea. So pretty! And I bet it tastes as good as it looks. Just give into the peaches. No use fighting them. 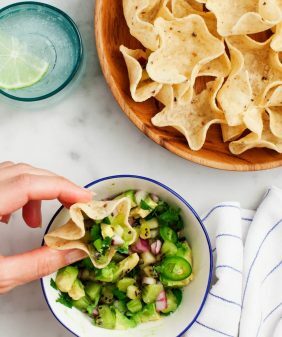 Your salsa looks mighty tasty, I made something similar last summer but added avocado and used cilantro instead of mint. It didn’t last long! Yay, peaches! We must be on the same wavelength 🙂 Peach salsa is one of my favorite things ever. I love your inclusion of mint here! 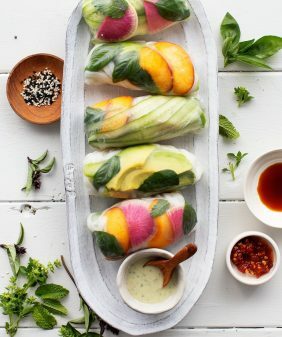 This sounds great…peaches are my absolute favorite! 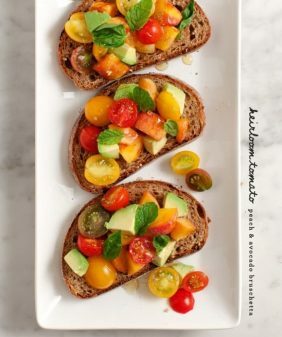 What a great idea and use of your CSA – loving the photos and the vibrant colors! Yum. I too am on a stone fruit binge these days. Just made the switch from apricots to peaches. Can’t wait to try this. I have an unbelievable bounty of huge peaches. I have canned preserves, I have frozen them for ice cream. Now I want to put up Peach Salsa, but…I need to know how long will the salsa will last and do I need to keep all of it in the refrigerator? The peaches are fresh and diced with fruit fresh in the refrigerator now, but if I put these in mason jars will they hold up for say a month. I intend to put up a lot. Any help would be wonderful….thanks. I’ve never preserved or jarred anything myself so I really have no experience to share in that category. This peach salsa recipe would probably only keep for a few days in the refrigerator. I imagine there would be more involved to making a peach salsa that can be jarred… if you find a recipe or method, please share! Can you use canned or frozen peaches? I have lots of canned and frozen peaches from my tree this year, along with lots of jalapenos!